This week has been chocked full of surprises for investors. Monday started out with a gut wrenching tumble of more than 2% across the majority of the investment universe. It was then followed up with some tepid buyers stepping in to support stock prices through mid-week. We were then treated to a disappointing non-farm payrolls report on Friday that many thought would tank stocks to new lows. Instead the SPDR S&P 500 ETF (NYSEARCA:SPY) rallied to within striking distance of its next major resistance point. 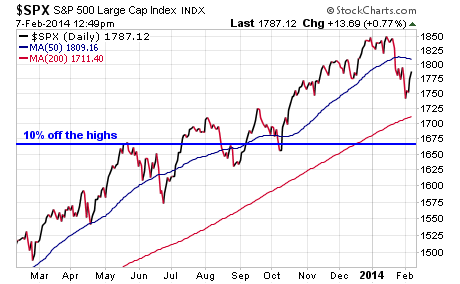 The bulls are likely fixated on buying the dip in stocks and reasserting the notion that 2013 wasn't just a fluke. Nearly every 3-5% pullback last year was bought with vigorous enthusiasm and stocks overcame a host of potentially disastrous obstacles. So far we are seeing some of those same price responses this year as well. The bears on the other hand are focused on taking out Monday's lows and pushing the market down below its 200-day moving average. The S&P 500 Index has not broken below its long-term trend line in well over a year now, which is a significant length of time. In fact, we would not even be in a true correction until the S&P 500 Index falls 10% from its high of 1,850. That would put us somewhere around the 1,665 level which I have noted on the chart below. No matter what side of the fence you come down on, it's best to have a plan for both sides of the trade. As an advisor, I am having conversations all day with clients and colleagues about the direction of the markets. Everyone expects you to have an opinion on whether it's going up or down despite the fact that markets don't behave in a rational manner. In fact, one of my favorite investing axioms is that "the market can stay irrational longer than you can stay solvent." What this means is that stocks can rally on bad news and fall out of bed on good news. Quite often there is no easy way to explain why prices react the way that they do. Everyone can have a theory why stocks rallied in the face of a bad jobs number, but no one really knows the true meaning behind this comportment. Instead of trying to take a one-sided approach to the market, I believe that you should be using price to your advantage in order to establish new positions at opportunistic entry points. Call me old fashioned, but buying low and selling high still works out every now and then. It often times doesn't feel comfortable to be buying something that is initially going down, but if you are confident in the investment and use a sell discipline then you can define your total risk. What you buy and how much is all a function of your risk tolerance and asset allocation. Those that are underweight stocks can be looking to add to core positions or enter new conservative investments in an ETF like the iShares U.S. Minimum Volatility ETF (NYSE:USMV). If you are worried about the potential for further declines in equities, you may opt to pair that with a deflationary asset class such as the PIMCO Total Return ETF (NYSEARCA:BOND). You can even consider an ETF that holds both stocks and bonds such as the iShares Moderate Allocation ETF (NYSEARCA:AOM), which has a beta to the S&P 500 Index of just 0.51. Investing isn't easy and everyone makes mistakes along the way. However, patience and discipline can help tremendously in allowing you to put money to work when opportunities present themselves. While you may not always choose the perfect entry point, you can increase your chances for success by shaping your portfolio to allow for growth with a temperate degree of risk. Disclosure: I am long USMV. I wrote this article myself, and it expresses my own opinions. I am not receiving compensation for it. I have no business relationship with any company whose stock is mentioned in this article. Additional disclosure: David Fabian, FMD Capital Management, and/or its clients may hold positions in the ETFs and mutual funds mentioned above. The commentary does not constitute individualized investment advice. The opinions offered herein are not personalized recommendations to buy, sell or hold securities.